If I built this SEO software, would you use it? My SEO needs are surprisingly modest. Although I have a lot of keywords I track, I have a need for a tool that would be particularly useful to beginner or mid-range SEOs. I mocked up this tool idea in an hour or so. If I coded it, would you use it? Would you pay for it? This is a tool I need, built exactly with the features I want. It's not intended for massive SEO campaigns, and I'm sure there's a huge list of potential features you could come up with. If I were to build it, I'd keep it dead simple and create it just like this mockup. It wouldn't require an account, either, so you'd just visit it, set up your keywords, and be on your merry way. I'm probably going to build this SEO tool whether the SEO community needs it or not. I'm just debating whether I should make it public or keep it for myself. Yes, I would definitely use this service, but as a young entrepreneur and college student I wouldn't be able to pay for it. YES. It looks like a very useful tool but it seems the trend in the SEO community is a lot of tools are free. Doesn't SEMRush has something similar to this? I think they only allow you to see a few of the rankings and then require you to pay more to view more. yep, i'd use it. have been looking for something like that for years. have used various versions where it's bundled into clunky, overdeveloped software but what you're talking about is just what i need - nothing more. col 6: rank at ... etc. i'd use it. and i'd pay for it if more features were offered, assuming they were very useful features. I'd use it in a heartbeat. I do a more or less manual version of what you're proposing and it grows tiring after about 2 minutes. I'd definitely use it! With just the one feature that's described in the image, i could probably see myself paying like 10-15 bucks as a one-time fee for using it. I'd definitely use it. I don't do a lot of SEO, but I've been looking for an easy-to-use tracking tool just like this. I mostly do it manually. I've seen the stuff you've designed and I'm sure it will turn out great. Yours have a few more functions, but it not worth paying for. Yes. This would be very useful. 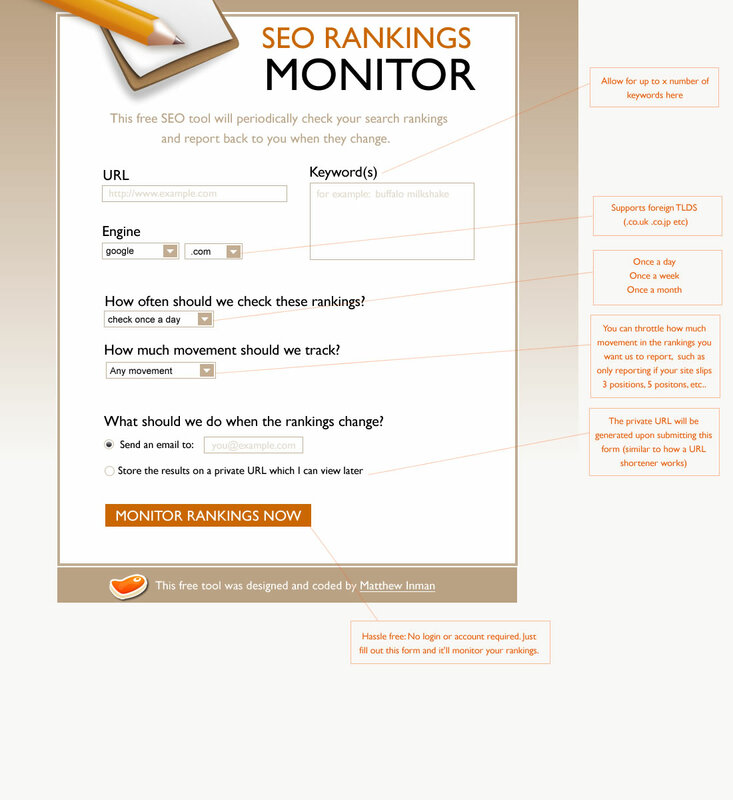 Mark: that link you provided goes to a rank checker, but it's nothing like the one I mocked up above. Basically I want one that automatically checks for me every day and reports back. Mathew, how about this model: You let people use the simple version free, and you charge companies for a more feature-rich version. Or you create a private-label version that web marketing companies can offer their clients. I would be curious about it, and would want to use it. I've heard that search engines might penalize you for using tools that ping their systems. Maybe this is just a rumor, but it makes me wonder. It would be a fantastic tool! Stefano, what does this software have to do with looking for links? I'd love to see something like this done on an open-source basis, or at least available with an open plug-in architecture, so that a tool with a good UI can be expanded on by the user community. Stop guessing if your link partners are playing by the rules or breaking them! I would deffinately use it. I'm always interested in finding out where sites are for certain keywords, but never get round to checking regularly. YES! I was using Digital Point's tool for ages, but that seemed to quit working for good a few months ago. I would even pay a monthly fee for a good tool like this. Considering that I would kill to have Inman make me a concept page for it. Considering that it is located at http://searchenginereports.net, to have Matt doing the same thing would make me cry because I know his would be better. This is David . I am team leader of a SEO company . I agree of your post . Search engine optimization (SEO) is the process of improving the volume or quality of traffic to a web site from search engines via "natural" or un-paid ("organic" or "algorithmic") search results as opposed to search engine marketing (SEM) which deals with paid inclusion. This software is really helps for SEO services.